Add all ingredients in a mixer except for the milk. Mix well. Add the milk, one tablespoon at a time until the mixture drops off the spoon, but isn’t runny. Divide between two tins and bake for 20 mins or until a skewer inserted into the centre of the cake comes out clean. Add custard powder with hot water. Mix icing sugar and custard paste with butter. Once the two cakes have cooled, spread this mix between the two cakes. Combine sugar, syrup and water in a saucepan over a low-medium heat until dissolved. Add the chocolate. Stir till the chocolate melts. Allow to cool before drizzling over the cake. Put all ingredients into heat proof dish and rub them using your fingertips. Rub until they come together in an even, crumb-like consistency. Spread this mixture evenly on the bottom of the dish and bake for 15 min in 200 degrees Celcius. From time to time open the oven and shake the crumble or break with fork so it will be easy to sprinkle over cake top. Remove from oven, set aside to cool down. 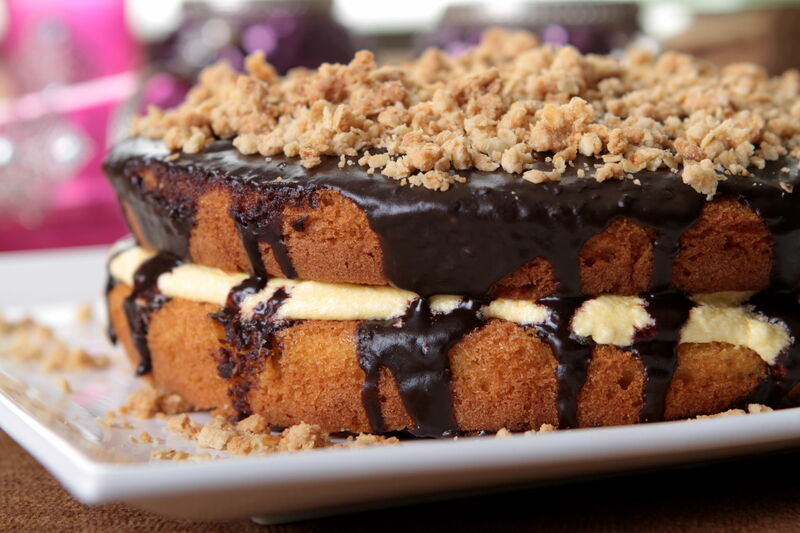 Once the cake is ready and the ganache has been drizzled over the cake, then sprinkle the crumble over the cake.